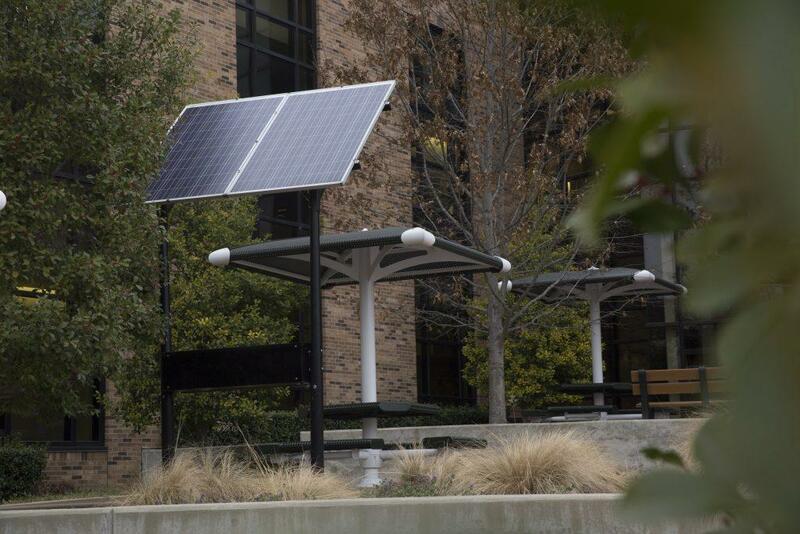 Photo by Eriana Ruiz | Solar panels in front of Brookhaven College’s X Building provide power for charging stations. Imported panels similar to these are subject to President Donald Trumps 30 percent solar tariff. President Donald Trump imposed steep tariffs on imports of solar energy cells, solar panels and washing machines Jan. 22, according to The New York Times, taking effective steps to bolster the American manufacturing industry and foster U.S. energy independence. For a long time, American companies have not felt the backing of their government in trade disputes. “There’s a real chance that this opens the floodgates,” Chad Bown, a trade expert at the Peterson Institute for International Economics, said, according to The Washington Post. Bown said until now, American companies have shied away from requesting help, feeling presidents who favor globalization would reject their pleas. Under a more nationalist president, these companies feel emboldened to request assistance. According to CNN, the new policy is already beginning to pay off. Trump framed the tariffs as a way to encourage foreign companies to bring manufacturing operations jobs to U.S. soil. A week after the announcement of the solar tariff, Jinko Solar, one of China’s biggest manufacturers, announced plans to open a new plant in the U.S.
“This deal will further solidify our leadership in the U.S. market,” Nigel Cockroft, general manager of Jinko U.S., said, according to a Jinko Solar press release. Jinko Solar officials declined to comment on whether the deal was a result of the Trump imposed tariff, according to CNN. Trump has faced criticism for the tariff. “It boggles my mind that this president – any president, really – would voluntarily choose to damage one of the fastest-growing segments of our economy,” Tony Clifford, chief development officer of Standard Solar, said, according to a Solar Energy Industries of America press release. SEIA officials feel the tariff will be a net loss for the U.S. solar industry, raising prices to be uncompetitive and therefore throttling demand. However, that is a short-sighted concern. Tobin Smith’s book, “Billion Dollar Green: Profit from the Eco Revolution,” claims renewable energy production will be a driving force in the economy of the future. “It’s not hyperbole to believe that the greatest wealth creation wave since the discovery of oil is upon us right here,” Smith, founder and editor of ChangeWave Investing and former market analyst for Fox News, writes. Smith said energy security concerns will be a new cold war in a world where the global demand for energy is rapidly rising. Renewable, green sources of energy will be needed to fulfill that demand and are projected to more than double as a source of energy from 2015 to 2040, according to the Energy Information Administration, a subset of the Department of Energy. Depending wholly on a foreign country for energy would weaken national security and reduce the U.S. from a world power to a Chinese puppet. People are more reliant on electricity than ever before. We have electric lights, electric stoves and electric cars. In 1977, New York City lost electricity for roughly 24 hours, which resulted in looting and riots. This entry was posted in Opinion by The Courier. Bookmark the permalink.